Patrick Prendergast is an RTC correspondent. 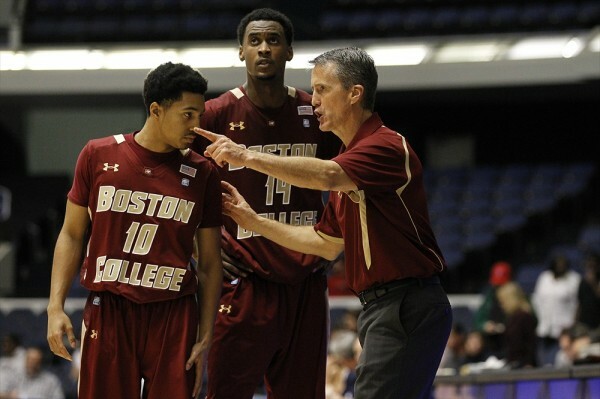 He filed this report from Saturday’s game between Boston College and Boston University. A fierce rivalry exists between Boston College and Boston University… at least when it comes to the puck dropping, anyway. Even people on the west coast know about “that Beanpot thing.” Ironically, the intensity and interest cool once the rivalry slides off the ice and onto the hardwood for the room-temperature edition. 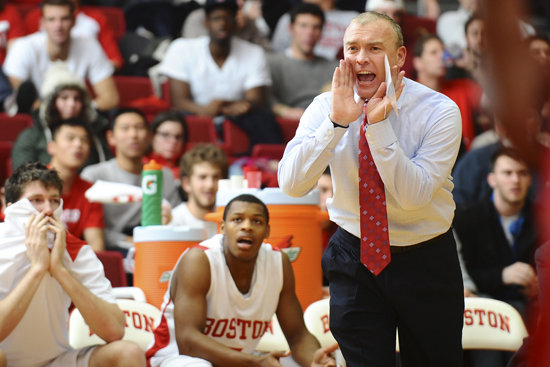 The Terriers and Eagles renewed roundball acquaintances on Saturday at Conte Forum on Boston College’s campus, raring to go with that last meeting in 2004-05 fresh in their minds. Wait, two schools separated by less than a four-mile stretch of Commonwealth Avenue have not played in seven years? We get that Boston traffic can be brutal, but c’mon now. Yes, Boston is known as a notoriously pro sports-centric town with seemingly little mainstream regard for collegiate athletics, but, as proven by hockey, an appetite exists. However that interest cannot be cultivated unless and until there are actual games played on a consistent basis. Now is the time to stoke up the hoop rivalry. The increased local exposure created could help both schools nationally. One program is working to make its second consecutive NCAA Tournament appearance, while the other looks to build around its young pieces to get to the next level. 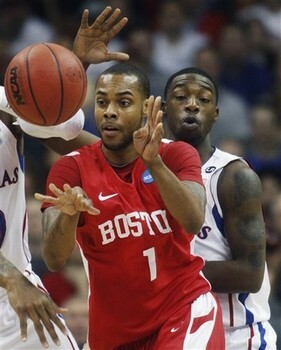 While you may be thinking BC is the established tournament-ready squad and BU is in rebuilding mode, think again. The NCAA unleashed the database for academic progress ratings (APRs) for coaches in six different sports on Thursday. While it’s fun to plug in coaches from a few other sports — anyone surprised by Pete Carroll’s 971, 24 points higher than the college football average in 2008-09, and six-for-six over 925? — the most fun for us comes from plugging in the names of college basketball coaches and seeing how they did each year. First, though, just a little background. The NCAA uses this little metric to determine how a team’s athletes are moving toward the ultimate goal of graduating, and the formula they employ to come up with the number is pretty simple. Each semester, every athlete gets a point for being academically eligible, and another for sticking with the school. You add those up for your team, then divide by the number of points possible. For some reason, they decided to multiply those numbers by 1,000 to get rid of the resulting decimal point (otherwise, it would have been as confusing as, say, a batting average), so if you get a score of .970, that means you got 97% of the points possible, and your APR score is 970. If you fall below the NCAA’s mandated level of 925, you get a warning, and then penalties if you don’t improve. Keep in mind, though, that if a coach changes schools, he shares his APR with the coach he replaced. And, the database only goes through 2008-09 right now. That’s why if you search for John Calipari, you’ll notice he has two APRs — a 980 that he received at Memphis which he shares with Josh Pastner, and a 922 for the same season at Kentucky which he shares with Billy Gillispie even though Calipari technically didn’t coach a game at Kentucky during that season. Because he was hired in 2009, he shares the APR with the preceding coach. You get the picture. Why is this man smiling? How about two straight perfect APRs? A couple of the numbers that people have been talking about the most since the database was released are the two perfect 1,000s put up by Bob Huggins‘ last two West Virginia teams. 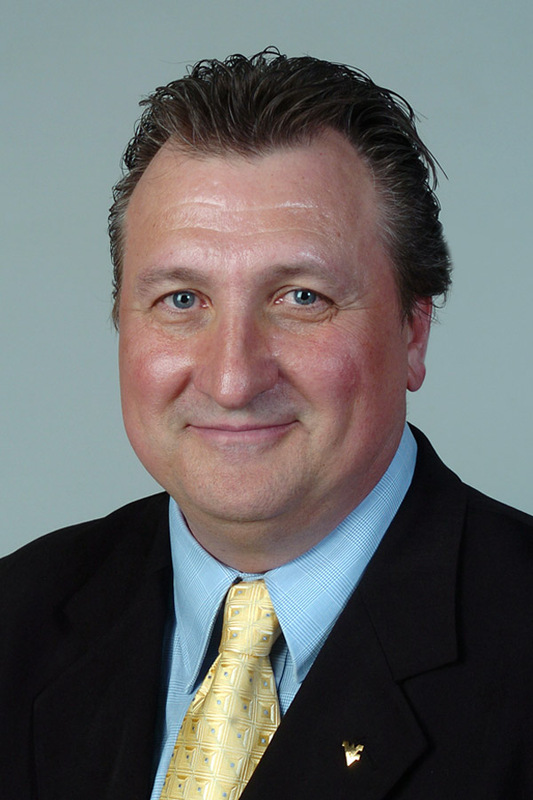 Most college basketball fans like to point the dirty end of the stick at Huggins when it comes to academics, and he’s been a lightning rod since his days at Cincinnati; rightly so, since his last three years as Bearcat boss saw APRs of 917, 826, and a eyebrow-raising 782. But his scores in Morgantown have been excellent, so he’d appreciate it if we all found a new poster boy for academic underachievement. An AP report today specifically mentioned Connecticut’s Jim Calhoun, who, in the six years the database covers, has had teams better than the national average — and over the 925 cutoff — only three times. In fact, the APRs of his last three teams have steadily declined, posting scores of 981, 909, and (ouch) 844 from 2006-2009. The same AP report fingered Kelvin Sampson as having even more harrowing results, having only two years in which he topped 900 (his 2004-05 Oklahoma squad scored exactly 900) — his 2003-04 Oklahoma team posted a 917, and his final roster at Indiana in 2007-08 turned in a downright hurtful 811. With a new toy like this, there was no way we could keep from checking all of the APRs of the Ivy League schools. 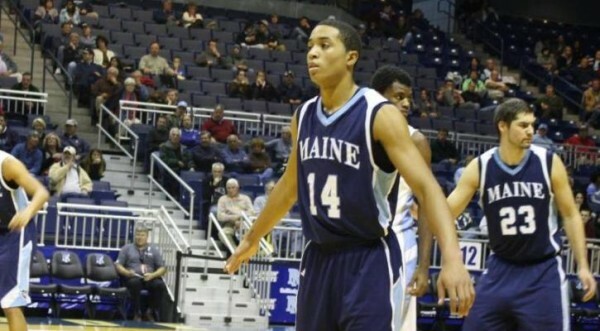 The most impressive tally was by Columbia’s Joe Jones, who posted six straight perfect scores of 1,000 but will now evidently become an assistant on fellow Ivy man Steve Donahue’s Boston College team next season. Only two teams in the league didn’t score a perfect score for the 2008-09 season. The two bad boys of the league were Glen Miller, whose Penn team from that season put up — gasp! — a 950 (he had two straight perfect scores before that), and Tommy Amaker’s Harvard squad from that year, which posted a 985. There have been several more comings and goings in the coaching ranks over the last few days. Two Ivy League schools filled head coaching positions, with Cornell replacing Steve Donahue with Virginia Tech assistant Bill Courtney, and Columbia replacing Joe Jones with St. Mary’s assistant Kyle Smith. In other vacant head coaching positions, Rutgers is expected to name a coach to replace the embattled Fred Hill sometime this week, and ESPN commentator Fran Fraschilla and Robert Morris’ Mike Rice are alleged to be the co-leaders. In contract extension news, Wisconsin’s Bo Ryan is now signed through 2015 in Madison and the long-awaited extension for UConn’s Jim Calhoun is supposedly near-completion despite rampant rumors of NCAA violations on the horizon. New Hofstra head coach Tim Welsh is off to a troubling start in his new job when he was found sleeping at the wheel of his Lexus early Friday morning with a blood alcohol level of 0.18. He pleaded not guilty to the charge of DWI and expressed deep regrets for his transgression but the school has suspended him indefinitely without pay while things get sorted out. Some key player news: Ole Miss starting forward Murphy Holloway, a sophomore who averaged 10/7 last year for the Rebs, is leaving Oxford for somewhere closer to his six-month old daughter in his hometown of Columbia, SC. Ole Miss is unlikely to allow him to transfer immediately to South Carolina, so Clemson appears to be the best bet for his future services. Cal starting forward Omondi Amoke was dismissed from the team for an undisclosed rule violation. He had been previously suspended for the Bears’ NCAA Tournament games against Louisville and Duke, and his departure means that Mike Montgomery will have to replace his entire starting lineup next season. At BYU, up-and-coming guard Michael Loyd, Jr., is also leaving, and it appears that his flamboyant style (he has sported a mohawk and a tongue piercing) may have had something do to with it. Assuming superstar Jimmer Fredette returns, BYU should still be fine in the backcourt with several returnees. The 2010 Jimmy V Classic has been announced with a solid doubleheader of games on tap: Memphis vs. Kansas followed by Michigan State vs. Syracuse. This event could involve three of the top ten teams in America. Dave Zeitlin is the RTC correspondent for the Ivy League. Following the Sports Illustrated story profiling Tommy Amaker and Harvard hoops, and with Cornell breaking into the Top 25, the intro this week was going to be all about the suggestion that the Ivy League could possibly receive (gasp!) an at-large bid to the NCAA tournament. The last time that happened was, well, never.Then Coach Amaker’s team did what most of his teams (Seton Hall and Michigan) have done previously — crashed and burned at the most inopportune time. 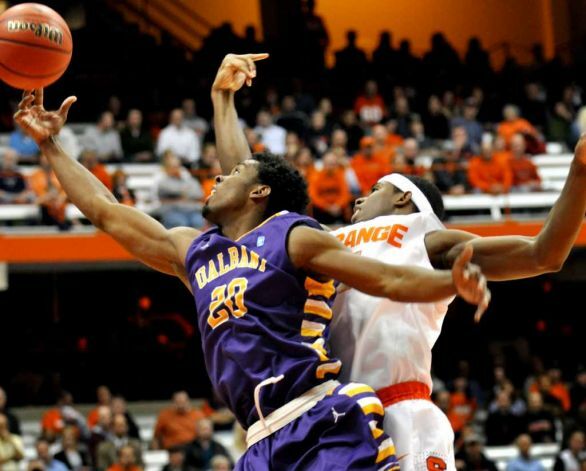 An 86-50 thrashing at the hands of the Big Red was followed by a detrimental loss to Princeton. So much for the at-large conversation, right? Wrong! Traditional one-bid mid-major conferences have a simple formula for getting a second team into the tournament: have the nationally known and ranked team get knocked off during the conference tournament – i.e. Butler (Horizon League), Gonzaga (West Coast Conference) even Siena (MAAC) – allowing the eventual conference tourney champ to get the bid. But wait, all you Ivy-savvy fans say, our conference doesn’t have a tournament. So RTC presents the formula to you: Princeton (undefeated in conference) splits with Cornell and both win the rest of their games (not impossible) forcing a playoff as both teams would finish conference play at 13-1. Princeton wins the playoff and gets the automatic bid and the Big Red gets an at-large, as ESPN shows the jubilation in Ithaca when Donahue and company see their name announced. This sets up an eventual rematch with Kansas at the Final Four. And to think the dream seemed so real. Rick Pitino’s mantra has always been shoot the three, defend the three and I’ll see you at the Big Dance. It has worked for him at all four of his college coaching stops (BU, PC, Kentucky, and Louisville). The way the game is played these days, the emphasis on success from beyond the arc has never been greater even with the line being moved back. Let’s look at how the “three for the money theory” has played out during the first two full weekends of Ivy play. Over the course of those 16 games, the losing teams shot a combined 67-255 or 26% from 3-point range. Columbia and Dartmouth each had a 1-for-11 game vs. Harvard and Cornell respectively, while Penn shot an unparalleled 1-for-18 vs. Yale. The winners shot an aggregate 111-for-281 or 39.5%. Not surprisingly, Cornell led the way with an 11-for-27 clip vs. Dartmouth, 12-for-27 vs. Harvard, and 13-for-27 vs. Yale, proving they are a bunch of equal opportunity shooters. Broken down by game, the losers are averaging about 4-16 while the winners approximately 7-17, a difference of 9 points per game. Now, if only I had some eligibility left…..
1. Cornell (6-0, 20-3): SRO in the locker room after games as Coach Steve Donahue has used an average of almost 16 players per game (19 vs. Dartmouth). Only Ivy coaches could remember that many names. The four victories have come by an average of more than 25 pts per game. After a tune-up at the Palestra against Penn tonight, the nationally ranked Big Red face Princeton on Saturday before a rematch with Harvard the following Friday – both on the road. 2. Princeton (4-0, 13-5): Their undefeated conference record has earned the Tigers the No. 2 spot in our bi-weekly power poll. More amazingly, the four victories have all come on the road – leaving only three games remaining away from home. Once again, defense has been the trademark with the Tigers allowing a mere 45 points per game in those wins. Jadwin Gym should be rocking this Valentine’s Eve (Ted officiating?) as Cornell comes calling. 3. Harvard (4-2, 15-5): Leapfrogged by Princeton thanks to a head-to head loss and the aforementioned disappointing performance vs. Cornell. We are guessing that they will be much better prepared for both rematches and at least one of the losses (most likely vs. Princeton) to be avenged. This team is too talented led by likely Ivy Player of the Year Jeremy Lin (17 points, four rebounds, and four assists per game) and the highly touted freshman class. 4. Yale (3-3, 9-14): One of two teams with a .500 record in conference completes the top half of the rankings. A home loss to Brown has been the only puzzling result and this Friday’s battle with traditional foe Harvard (a 29-29 tie perhaps?) should be the talk of New Haven. Alex Zampier’s 17.5 pts per game paces the Elis. 5. Penn (2-2, 3-15): The other team with a .500 record jumps two spots because as we know, it is the all-important loss column that counts. 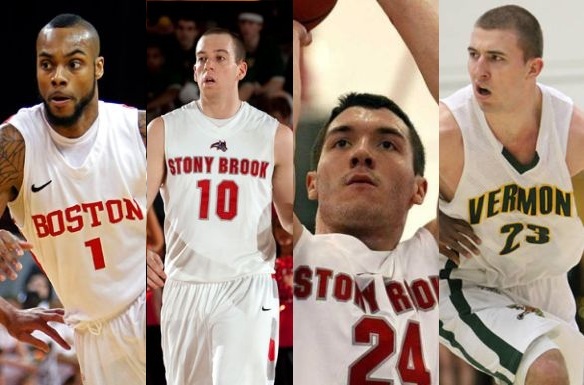 The ship appears to be somewhat righted thanks to the return to Ivy competition, the shortening of the bench by Jerome Allen, and the emergence of Dan Monckton as a complement to Zack Rosen. The junior has averaged over 11 pts over the last four games, including a controversial buzzer-beating tip-in vs. Brown. 6. Columbia (2-4, 8-12): Is Joe Jones headed for his fifth consecutive 7-7 Ivy season? To do so the Lions will have to overcome the injury bug that has plagued them, particularly to senior guard Patrick Foley, and an upcoming four-game road trip that includes stops at Princeton and Harvard. Columbia continues to be near the top of NCAA in 3-point shooting efficiency led by the marksmanship of Noruwa Agho (51.6%). 7. Brown (1-5, 7-16): The only thing keeping the Bears out of the cellar is Dartmouth. Five consecutive losses, albeit competitive ones, followed a promising conference- opening victory at Yale. Superman Matt Mullery leads the team in ppg (15.3), rebounds (6.0) assists (3.0), field goal percentage (55.3) and blocks (1.5). 8. Dartmouth (0-6, 4-16): After a close home loss to Harvard (in which they actually led in the second half) things have fallen apart for the Big Green. Their next four losses have been by an average of 16 points and their offense could not produce more than 51 points in any game. Coach Mark Graupe continues to look for a productive combination as no player is averaging more than 27 minutes or eight points per game. This Friday’s game vs. Brown could be the first of two basement battles. Ray Floriani of College Chalktalk is the RTC correspondent for the MAAC and NEC Conferences. When he’s not officiating, he’s canvassing the northeastern basketball circuit for good games and stories. 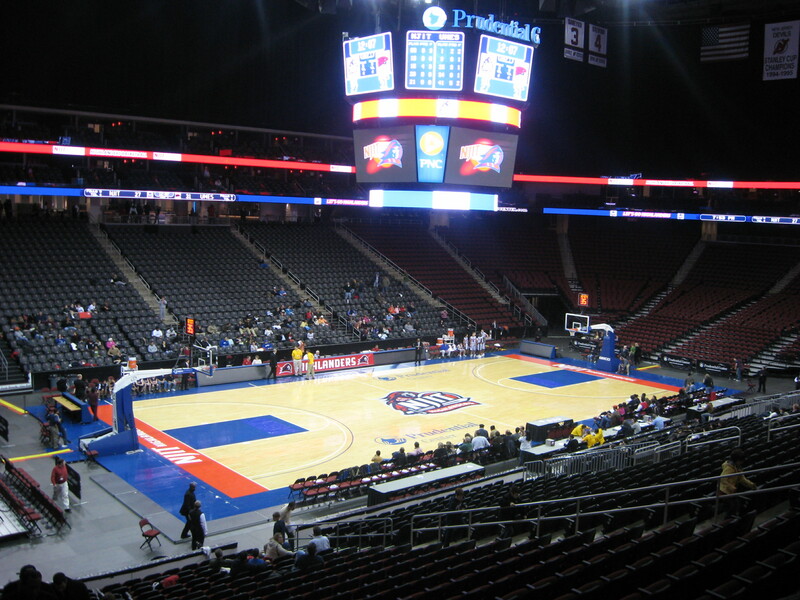 NEWARK, NJ – The evening actually began in Jersey City. 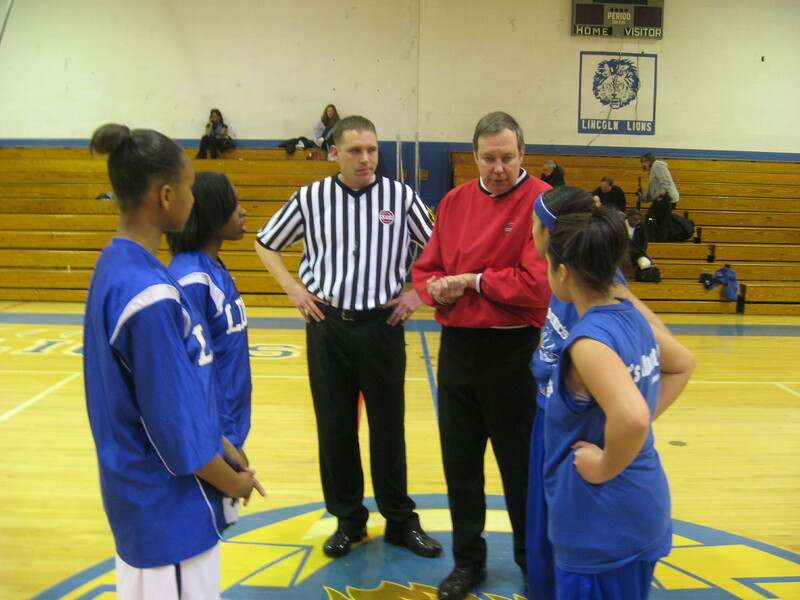 The other part of my basketball life as an official saw a JV Girls assignment at Lincoln High School. Pictured is the pre-game captains meeting which is great because the kids on that level soak in your every word. For the record Saint Dominic Academy edged Lincoln in a close one. Off to the Prudential Center, a quick nine mile journey for Maryland Eastern Shore vs. NJIT. The Highlanders dropped a 4 point decision at UMES in early December so hopes were high for a second win in two weeks. It was not to be on this night. 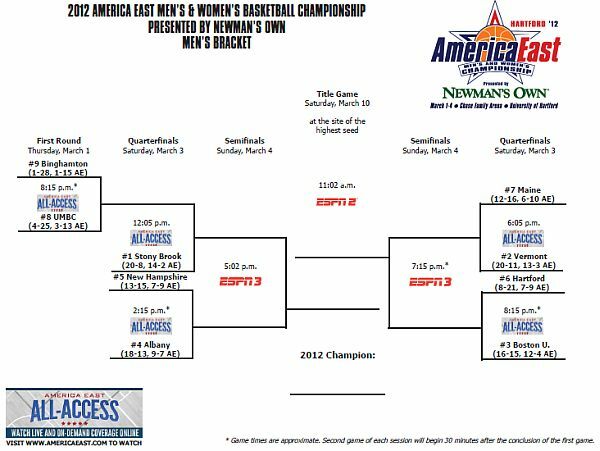 UMES took a few eight point leads but NJIT would battle back. The Highlanders even took the lead with eleven minutes to go but UMES answered with a three point field goal followed by a conventional three point play to regain an edge not to be lost. NJIT battled gamely and had it to a two possession contest before UMES hit four free throws the final 30 seconds for the 73-67 win.